Wanna Be In A Birthday Boat Parade? 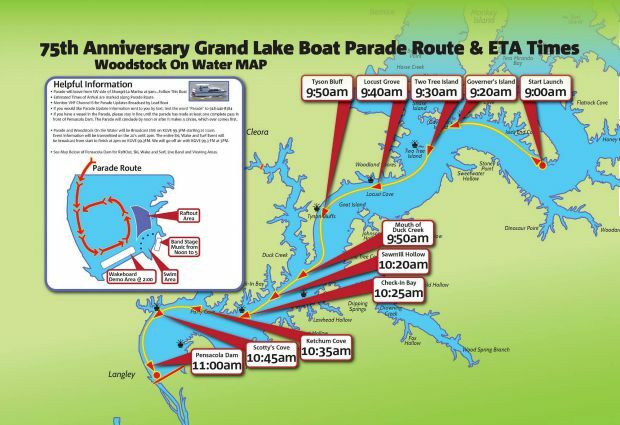 The 75th Anniversary Grand Lake Boat Parade is going to take place on Saturday, August 8th, as part of the Birthday celebration for Grand Lake and Pensacola Dam. And you can be a part of the longest, most festive boat parade in the 75 year history of Grand Lake! The Lead Boat will leave Monkey Island – the South side by Shangri-La Marina – at approximately 9 am on that Saturday morning and start heading towards Pensacola Dam. 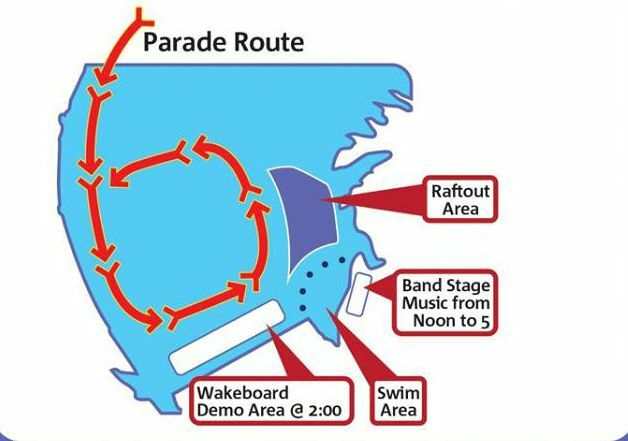 The parade route will follow the main channel (the deepest part) all the way to the dam. Of course, there are rules, because without rules it would be an unruly parade…and who wants that? Fall in line behind the last boat in line…when ever and where ever you’d like. Maintain the constant speed of the boat you are following while maintaining at least 50 yards between you. If you decide to leave the parade line, please exit to the side that has the most lake. And if you then want to come back into line in the parade…well, go the end of the line – You lost your place. When the parade reaches Pensacola Dam (around 11ish), the lead boat will make a pass for the spectators on the dam, and then fall in line behind the last boat in the parade. The parade will continue to parade in a circular motion for as long as it continues to parade in a circular motion. Wait. What? Got that last part? Yea…me neither. Rest assured there will be an orderly conclusion to the parade once it reaches the dam…or not. We’ll see. KGVE 99.3Fm will be simulcasting things beginning at 11 am and will have coverage of the fun at the dam until 3 pm, which is when the wake and surf exhibition is scheduled to conclude. Now…it’s not required, but there is a tremendous amount of Grand Lake peer pressure for you to decorate your boat. So I guess you’ll be decoration your boat for the occasion. It is 75 Anniversary of the completion of Pensacola Dam and the birth of Grand Lake. That’s the DIAMOND ANNIVERSARY. Think Bling. At the conclusion of the parade – or, once the parade stops parading in a circle – you will have arrived at The Woodstock RaftOut. So…maybe you want to go with the Woodstock them. Peace and chicken grease…whatever floats your boat. The most important part of the parade is YOU! If you don’t participate, it won’t be much of a parade….so all of Grand Lake is counting on YOU! Stay tuned for more details as we get closer to the 75th Anniversary Celebration for Grand Lake and Pensacola Dam! NextWant To See 10 Grand Lake Waterfront Homes For Sale – Right Now?